Here at Bassé, we search the world to bring you the freshest, most flavorful nuts, seeds, and dried fruits. As one of the premier healthy snack companies in North America, we’re focused on sourcing and distributing wholesale snacks that today’s consumers truly enjoy. 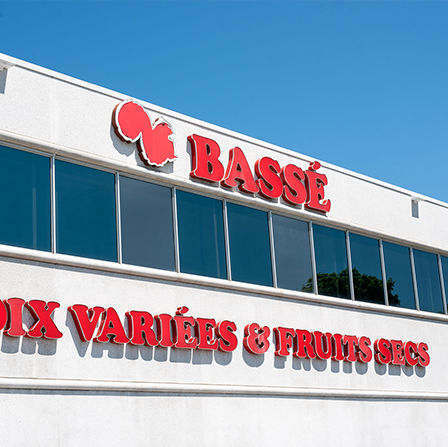 With over 30 years of experience, Bassé is a business with an unwavering commitment to leading the industry as wholesale snack food distributors. We source, roast, blend, pack, and distribute dried fruit and nuts in bulk, as well as edible seeds and a wide variety of specialty items. Our goal, like the businesses we supply products to, is to offer consumers exactly what they’re looking for: healthy and convenient snacks, globally sourced and always fresh. Our story wouldn’t be the same without our retail partnerships. When it comes to healthy snacks, suppliers must be transparent about their processes and their ingredients. We work hard to achieve transparency in every aspect of our business, including our raw material sourcing and distribution, complete private label services and wholesale collection of Bassé branded snack packages. From where and how our products are sourced to the steps that complete their journey to your shelves, we’re proud to work as not just your supplier, but your partner. Over time, we’ve built strong relationships with some of the best nut, dried fruit and seed suppliers around the world. We’ve used those relationships to help our clients—you—grow their businesses every day by providing quality products that are competitively priced, and taste delicious. Our people are one of our most valuable resources. We’ve built a team of highly trained and skilled professionals who always put integrity and principles first. We work diligently to provide the most exceptional and specialized service possible for all of our clients, which includes using only the highest quality raw materials and being responsive to all client requests. Trust. Highlighting the need for transparency on our own end and on the end of our global suppliers. Dependability. Being accessible to our clients and responsive to their needs at all times. Flexibility. The ability to work creatively to find solutions and take our clients’ brands to the next level. Let our story help build your own. Get in touch to learn how our wholesale and private label services can help elevate your brand and provide you with the healthy and inspired snacks that consumers want.